There is something so fresh and inviting about an all neutral outfit, don't cha think? Last weekend I took full advantage of the brief stint of spring-like weather we had and went bare legged! I love playing with different tones of neutrals to give off such an effortless, yet put together look, regardless of the season. Whenever the sun is shinning it's like I am compelled to wear lighter, or brighter tones. It just ups my mood and makes me most happy. Since this day was the first mild, sunny day in a bit of time I guess I went all out! Although there definitely isn't a formula for going monochrome, there are a few rules I like to follow while decked out in the same colour palette. Play with the shapes. Combining a tight fitting skirt with a more loose fitting pullover really gives some definition to the outfit. Tucking in the pullover forces the waist to become the point of interest and keeps the outfit from looking like a shapeless, long garbage bag (am I right?). Mix up the textures. The sweater is knit, the skirt is cotton and although both pieces are ribbed, the ribs are different widths, which is more visually appealing. The marble-esque bag also adds in another textural element and creates another point of interest. On a side note-- do you believe I almost sold this bag because I didn't think I'd wear it enough?!! Crazy, I know. SO glad I hung onto it! Combine shades. Each piece is of a different temperature, but they totally complement each other when paired together. I love going monochrome for this reason; it allows you to pull unlikely pieces together and create something beauteous! Add in some fun jewels and some low booties (this was a Sunday afternoon, after all) and you are ready to rock! Do you have any rules or guidelines you like to follow when going monochrome? I'd love to hear! Yes, great tips! Trying out different textures of the same colored fabric can create more dimension to the look. PS - that handbag is adorable! Thank you Abby! I love playing with the same colour pallet, too! I love the monochromatic look on others, but I don't think it is something I go for because I love colour so much and also can't stick to only one colour palette when it comes to outfits. Loving this look on you though. 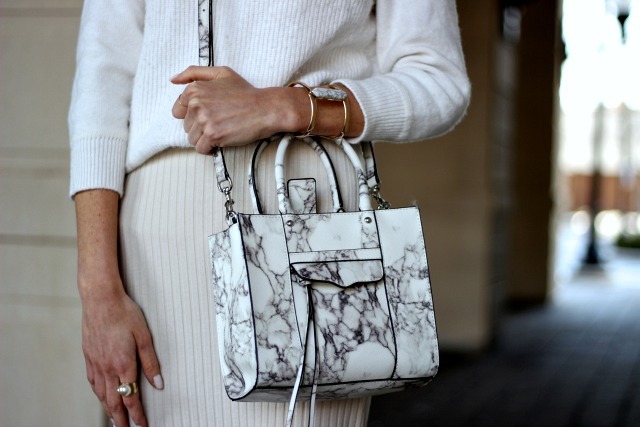 And the marble handbag is one of my favourites. lol yes you do love colour! It's fun to switch it up once in a while though! You may surprise yourself! such a cute look! that purse is the perfect touch! darling look! Thank you Kelsey! The bag is my favourite right now. LOVE this monochromatic look Gabriella! You've definitely inspired me to try the look out for Spring! Aww, I'm glad! It's fun to switch it up from my usual colour scheme and pallet! haha! Thanks Jackie. I've been trying to hold on to it, but it is definitely faded now. Boo-hoo! Guess I need another vacation! LOVE this monochrome look on you. I am a total neutrals fan myself. Add a midi and it is a guaranteed favorite. That bag! Major heart eyes. I am so so SO madly infatuated with this outfit, Gabriella. It's so chic, crazy chic, and dreamy. Just glorious.